The purple root vegetable are eaten either boiled, roasted and cooked vegetable. They used it in salad combined with any salad vegetable adding with oil and vinegar or any other dressing. Beetroot contains high levels of chemicals called nitrates, which have been shown to enhance physical activity performance, endurance and stamina. Researchers at St Louis University in the US recruited 11 fit and healthy men and women and got them to twice run five kilometers on a treadmill. The results, published in the Journal of the Academy of Nutrition and Dietetics, showed that after eating the cranberry relish, the runners averaged a speed of 11.9 kilometers per hour (7.3 mph). 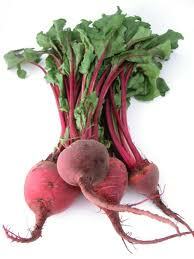 But after scoffing beetroot, their average speed went up to 12.3 kilometers per hour (7.6 mph). The findings support earlier research, published in 2009, by British scientists which suggested drinking beetroot juice could have a powerful effect on stamina and endurance, as well as lower blood pressure. Research published in the American Heart Association journal Hypertension showed drinking 500 ml of beetroot juice led to a reduction in blood pressure. The effect is attributed to the high nitrate content of the beetroot where It is thought lead to the blood vessels widening, improving oxygen supply to the muscles.